The ongoing conflict in Ukraine, coupled with Russia's economic decline, has facilitated the separation of Belarusian national identity from all things Russian. The government has made an effort to differentiate Belarus's interests from those of the Kremlin and to wean the country off Russia's military and economic support. Some new members of the political elite have even demonstrated a willingness to collaborate with civil society representatives and to reform the Belarusian economy. Liberals in the government are increasingly open to dialogue with independent economists. And yet, old habits die hard. The authorities continue to falsify elections and to expel democratic activists from universities. And while the private sector's share of national GDP in 2015 may have exceeded the government's share for the first time, the state continues to dominate the Belarusian economy. Financial Diet: Reforming State Finances of Belarus, a book written by a group of twenty Belarusian and foreign economists, is coming out this month. The book's editor Kiryl Rudy is an economic adviser to Belarusian President Alexander Lukashenka, and one of the younger representatives of the Belarusian political elite. He was a Fulbright Scholar in the United States, and worked as a lecturer and an economic counsel​lor at the Belarusian Embassy in China. In the past, Rudy has not shied away from supporting Western-funded pro-reform events such as the Kastrychnicki Ekanamichny Forum. He also invited several independent think-tank analysts to become co-authors of the new book. This change in style appears to be rubbing off. In December and January, Pavel Danejka, one of the most influential pro-reform economists in Belarus, was interviewed by the state-owned paper Belarus Segodnia (Belarus Today). Such readiness to collaborate suggests that the pro-reform bureaucrats may need independent economists to say what they cannot express themselves. Rudy's appointment in 2013 reflects the slow rejuvenation of the Belarusian political elite, who increasingly advocate reforming the Belarusian economy. New appointees include Deputy Head of the Presidential Administration Mikalai Snapkou, First Deputy Prime Minister Vasil Maciusheuski, Ambassador of Belarus to France Pavel Latushka, and others. The changes in the ranks of Lukashenka's bureaucracy have been conducive to some changes in the country's economic policy. For the first time on Lukashenka's watch, Belarus's central bank, the National Bank, has acted prudently to stabilise the country's macreconomic fundamentals. Although the Belarusian economy shrank by 4 per cent last year, this decline occurred mainly in the public sector. Independent experts and government officials say that in 2015 the GDP share of the private sector may have exceeded the government's share for the first time. In the last two years, Belarusian national identity has experienced a revival of sorts. In 2015, "Mova nanova” Belarusian language courses were held in ten cities; Belarus's top basketball team Cmoki (Dragons) took down the Russian-language version of its website; and oil company A-100 started to use the Belarusian language when communicating with its clients. Even the official policy towards the Belarusian language has changed, as the authorities adopt policies to foster rather than hinder its development. Belarusian national identity has strengthened not only culturally, but also politically and militarily. The Belarusian authorities have sought to dissociate themselves from Russia's actions in the international arena. The Belarusian regime, for all intents and purposes, seeks a conciliatory role in the conflict between Russia and Ukraine. Minsk has also refused to support Moscow's expansion in the Middle East. 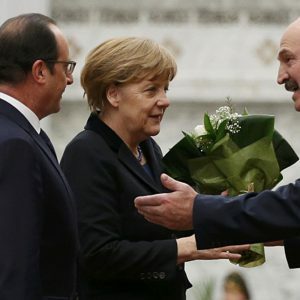 President Lukashenka even stated that Belarus would like to mediate the conflict between Moscow and Ankara following the downing of a Russian jet fighter by Turkey. Some changes have also taken place in the military sphere. Belarus has urged the Kremlin to abandon plans to establish a military base in the country. At the same time, Minsk has sought to reduce its military dependence on Russia, narrowing the scope of cooperation in areas ranging from military training to arms manufacturing. Despite some positive changes, many things remain the same in Belarus. Foremost, the authorities presided over a fraudulent presidential election in 2015, in keeping with elections past. The Belarusian opposition remains fragmented and has very little influence on Belarusian society, which itself is politically passive. On 20 January, a local student activist, Hleb Vajkul, was expelled from the Belarusian State University for organising a recent student protest. In general, it seems that the political elite has lost touch with the everyday needs of Belarusians. When the country experienced a massive snowfall in early January, the government proved woefully unprepared, and locals were forced to devise their own snow removal plans. Rather than apologise for inadequate public services, the authorities decided to launch a public relations campaign for a "citizen's initiative". The executive committee of Minsk, the capital, sent the city's inhabitants a crude text message urging them to assist in clearing the snow. The state newspaper Belarus Segodnya published a page 1 headline titled Authorities Organise Society Against the Elements. Many ordinary Belarusians view such behaviour by the authorities as cheap posturing. Changes in Belarus have been precipitated by the onset of the Ukrainian conflict and exacerbated by Russia's economic decline. As people begin to lose faith in Russia's ability to become an economic power, it also becomes more difficult for Belarus to ignore the West and vice versa. The current situation offers an opportunity for cooperation with the West on a variety of issues, such as stabilizing Ukraine, controlling the flow of migrants from the Middle East and North Africa, containing Russia, and perhaps even the democratisation of Belarusian politics and society. The recent changes may only mark the beginning of a longer process. The coming years represent a crucial juncture during which the Kremlin's influence, in particular as a provider of capital to stabilise the Belarusian economy, is likely to wane further. The question is: will the government in Minsk undertake more ambitious steps to reform the country? If so, how? There is now a need for a greater presence of the West in Belarus. The European Union and the United States can become not only advocates of potential reforms, but also spur the changes that are already taking place in the country. Particularly now, it seems important not to reduce Western support for Belarusian civil society. In the near future, strong NGOs may have a window of opportunity to broaden their agenda, even if some of these activities run counter to the preferences of the Lukashenka regime. Russian Topol-M Intercontinnental Ballistic Missiles Need Belarusian Chassis. Image: Wikipedia. On 5 January, Russia declared that Belarusian firms would get direct access to Russia's military procurement orders. It this really happens, it will mean that Russia has completed the process of replacing Belarusian components with Russian ones. Minsk is looking to diversify its links in the military sphere. Recently, it continued working with China and Pakistan, and may even have made a deal with Saudi Arabia. Meanwhile, Belarus faces ever bigger repercussions from the war in eastern Ukraine. Minsk is suppressing important information on these consequences. Only recently local authorities revealed the dramatic growth in weapons trafficking in the southern regions of the country. The Aviation Herald recently reported that on 26 December a plane belonging to the Belarusian company Transaviaekspart loaded with 100 tons of bombs had broken down in Saudi Arabia. The plane reportedly was bringing bombs to Saudi Arabia for use in the Yemeni civil war. This incident corresponds with known facts about Minsk's collaboration with the West and Western-allied powers in the region. These include evidence of Belarusian aviation transporting supplies for the French army, selling bombers to Sudan and engaging in military cooperation with Qatar. Continuing cooperation with Pakistan also follows this pattern, as Islamabad is a partner of conservative Arab regimes allied with the West. On 11 January, Belarus' Defense Minister Andrei Raukou met Ambassador of Pakistan Masud Khan Raja. According to official information, the two “reaffirmed the willingness to strengthen [military] cooperation.” Co-operation with Pakistan, which has been actively going on for more than two years, includes a significant military component. It is unclear how Minsk launched such dynamic rapprochement with Islamabad. Not only conservative Arab regimes but also China, a traditional Pakistani ally, might be behind it. China remains a key partner for Belarus. On 15 January, the Belarus-Chinese satellite Belintersat-1 was released from the Chinese Xichang Space Centre. The Belarusian Military Industrial Committee was in charge of the project from the Belarusian side, while Great Wall Industrial Corporation carried out the project from the Chinese side. Officially, the new satellite provides only services of a civilian nature. The launch is the latest in a series of cooperation projects with China Aerospace Science and Technology Corporation (CASC), which owns Great Wall Corporation. Last year, Belarus demonstrated a new multiple launch rocket system called Palanez and established a production line to manufactures its rockets. That apparently took place with the assistance of another company belonging to CASC, Sichuan Space Industry Corporation. It is noteworthy that this is the first time that Minsk has resorted to Chinese services to launch a satellite. Belarus previously implemented its space projects with Russian help. On 14 January, the Secretary of Ukraine's National Security Council Oleksandr Turchynov announced that Russia had deployed its military units to the Belarusian airbase in Babruysk. Moscow allegedly sent Su-27 fighter jets, attack helicopters and military transport aircraft to the airfield. According to Turchinov, that is part of a large-scale deployment of Russian forces along Ukrainian borders. Belarus' Defence Ministry denied these claims. The media did not produce any evidence to support the accusations, either. Belarus also faces ever more frequent repercussions from the conflict in eastern Ukraine on a local level. On 11 January, Belarusian police detained a man from the southern Brest Province who had fought on the side of the rebels in Ukraine's Donbas and Luhansk regions. In November, another Belarusian from the northern Vitebsk Province who participated in the conflict on the side of the Ukrainian government was arrested in Minsk. Commenting on the latest arrest, head of the Brest Regional Department of Internal Affairs Fyodar Baleika said that the man would be prosecuted for participating in the war in eastern Ukraine. He also revealed other previously unknown facts. In Brest Province alone, police registered 78 criminal cases of weapons trafficking in 2015. That is over three times more than in 2014 when just 21 such cases were lodged. For example, when Belarusian police – apparently following a Ukrainian request – searched the flat of a fighter arrested in Ukraine for serious crimes it found grenades. Minsk often avoids publicising these facts. In early January, Belarusian media revealed that in December 2015 a management company of Beltech Holding, a defence industry firm, had been sold for about $30m to an unknown buyer. In 2011, more than 500 people worked in Beltech Holding. It includes numerous companies, among them Beltekhekspart, one of the three authorised arms exporters of the country. After previous owner of the Beltech Holding Uladzimir Peftiev was accused of financially supporting the Belarusian government and was sanctioned by the EU, he sold the holding in 2012 to another businessman, Dmitry Hurynovich. Last October, the EU suspended sanctions against Beltech Holding. Hurynovich immediately sold the company. On 5 January the Russian government took a decision to grant member states of the Eurasian Economic Union a “national regime” in trade. Their firms dealing with goods and services which are not exempted from that rule can now work in Russia on equal terms with Russian businesses. It means that Belarusian firms can now freely sell their military products in Russia, emphasised Russia's TASS news agency. Moscow for years has promised to let Belarusians directly participate in its military procurement tenders. But as late as 2 October the Chairman of Belarus' State Military Industrial Committee Siarhei Huruloyu complained that Belarusian firms still had not received such an opportunity. He suggested it might be because Russians distrust Belarusian firms. It remains unclear whether this time the situation will really change. Russian officials since the early 2010s have repeatedly declared their intention to replace all foreign, including Belarusian, components and items of military equipment with Russian analogues. This policy seems to be failing. A case in point are the chassis produced by Minsk's MZKT factory. For five years Russian firms, like KamAZ, have been working to develop replacements for MZKT products, without success. Last autumn, media published illustrative facts showing how Russia still needs MZKT. 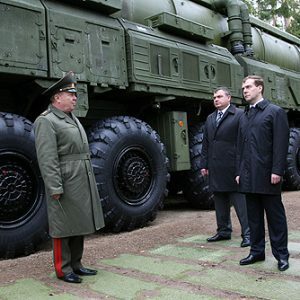 In September, specialist periodical Voenno-Promyshlennyi Kurier quoted an anonymous Russian official as saying that Russian producers were going to continue installing their state-of-the-art ballistic missile system Iskander on Belarusian chassis. In October, the Russian firm Start signed a new contract with MZKT to supply semi-trailers needed for S-300 and S-400 surface-to-air missile systems. The Russian government's decision might mean official approval of continuing use of Belarusian defence products.